Yesterday I made my first trek over to Uncle Hugo’s bookstore, which, like any good bookstore, is wall to wall filled with books. Ahh, but Uncle Hugos is a SFF bookstore, so it is wall to wall with nothing but SFF. New and Used. It is a delightful place to which I am definitely going to return. As soon as I walked in past the back issues of Asimov’s and F&SF I knew I was in one of the local branches of heaven. I wanted to look for a copy of Elizabeth Bear’s Carnival and the fifth Wild Cards volume. I was in the store for ten minutes before I remembered what I wanted to look for. I never did remember Wild Cards, but I saw the Bear and decided not to pick it up this time. Almost picked up Caine Black Knife and Fast Forward 2, but I kept browsing, kept remembering stuff. And then I saw it. Liavek. It’s nothing I was ever looking for, but as soon as I saw it I knew I had to get it. 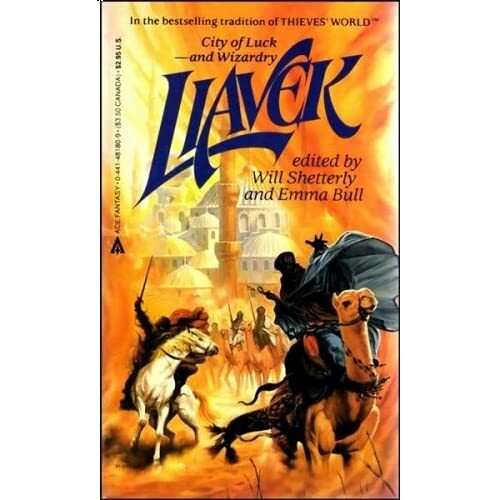 Liavek is a shared universe anthology created and edited by Will Shetterly and Emma Bull and was published back in 1985. I know nothing about the world, except that it is from Shetterly and Bull. Including tax, it only cost me $2.15, so you can’t beat that! Liavek -- what a score! The thing is packed full of great writers. It makes me want to hit my local used book store. Unfortunately, it's always packed with students who sit directly in front of the shelves in the SF/F section. BUgs the crap out of me. Uncle Hugo's was fairly quiet on a Sunday afternoon...which is nice. I didn't have to deal with any parking issues and I was able to browse at length without getting in anyone's way (or anyone in mine). Not sure how long I spent, but it was nice. I'm excited to get a glimpse into the early careers of Brust, Kress, Bull, and Shetterly.